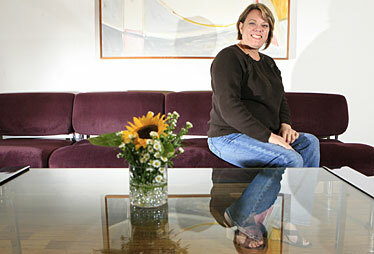 Jaimie Kahale, an educator with the Life Foundation, reaches out to women with HIV and AIDS. This past year, she was featured in a video documentary, "HIV in Hawaii: Local People, Local Stories," that played to isle public schools. As prevention educator for the Life Foundation, Jaimie Kahale counsels women who are HIV-positive, like herself, and those at high risk of contracting the virus that causes AIDS. The Life Foundation is the oldest and largest Hawaii organization providing services to residents with HIV and AIDS. Kahale, 43, also reaches women through the foundation's SISTA project (Sisters Informing Sisters on Topics about AIDS), which aims to prevent HIV infection among young adult, minority women. Even before becoming a Life Foundation employee, Kahale was among a group of volunteers, both HIV-positive and negative, willing to speak to community groups and schools about HIV and AIDS. Even now she continues to speak to groups outside her job responsibilities and has been training new speakers. This past year, Kahale expanded her reach into the state's public high schools thanks to the video documentary "HIV in Hawaii: Local People, Local Stories." The video features Kahale and another person living with HIV. The state Department of Education produced the video last year to include in its health education's positive prevention curriculum. Teachers trained to provide the curriculum often ask Kahale to speak to their students in conjunction with the video. "She is a very highly requested person," said Dave Randall, state Department of Education Coordinated School Health education specialist. Since the national AIDS epidemic started in 1983, there have been 13 AIDS diagnoses among Hawaii teens, ages 13 to 19, said Peter Whiticar, state Department of Health STD/AIDS Prevention branch chief. Eight were diagnosed before 2001, he said. However, there are no reliable statistics for Hawaii teens testing positive for HIV. Hawaii is not among the 33 states that have confidential name-reporting of teens with HIV. Kahale said reaching teens has been her passion since getting involved in educating people about HIV and AIDS, because she remembers her own risky behavior when she was a teen. "Their behaviors haven't changed much, but it's a lot scarier nowadays," Kahale said. In a daily countdown, the Honolulu Star-Bulletin is profiling 10 people who have made a difference in Hawaii during the past year. These are people who worked in any field --community service, education, politics, law, labor, medicine, science, business, sports, entertainment, the arts -- to make a difference. Some fought controversial battles in public. All that matters is that each, to the one, had a devotion to their cause that made a profound impact on Hawaii. » Dec. 28: Moses Kalei Nahonoapiilani Haia III, Native Hawaiian Legal Corp.